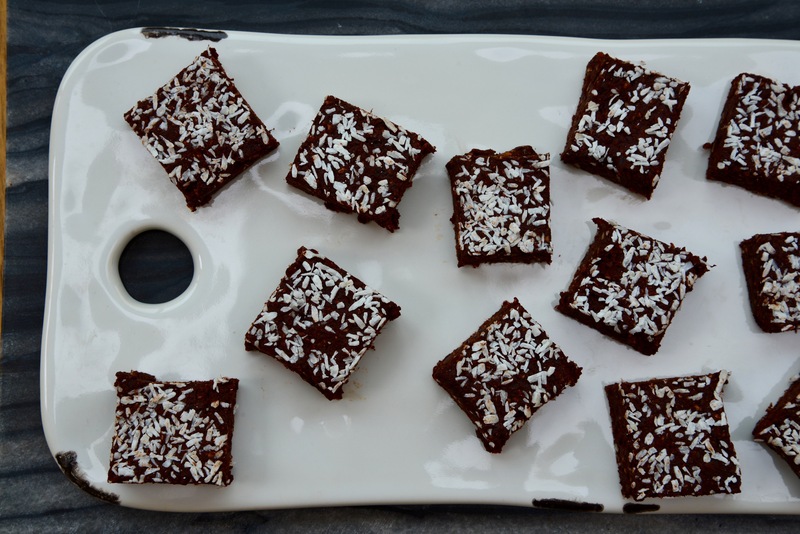 Here is one the recipes from my GAPS on the Go workshop last week, where we made lots of snack and lunchbox foods – and then sat down and ate them! Thanks so much to everyone who came. If you missed out watch this space, as I will be offering the workshop again next autumn. Combine all ingredients in a bowl and mix well using a hand-held mixer (or a stand mixer if you have one). Divide the dough by half, then half again 3 more times until you have 16 equal parts. Roll each part first into a ball, then into a pencil shape using your fingers. Place on a baking sheet lined with parchment paper, and bake for 12 minutes turning once halfway through. Important: these breadsticks are quite soft when they come out of the oven. 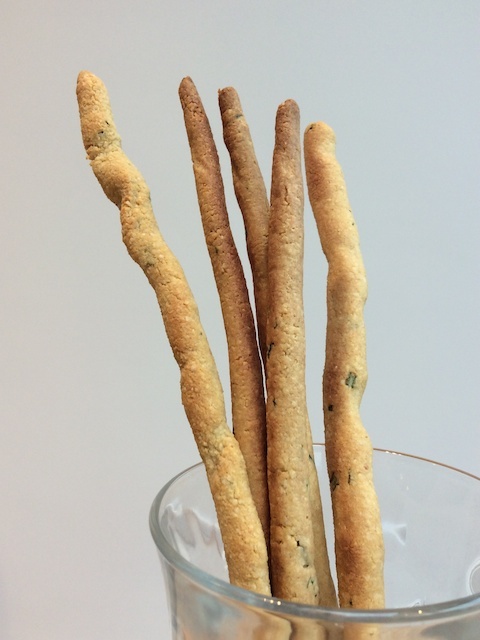 For crispy breadsticks, cool and dry on a rack for 48 hours. I love popping into my local Japanese supermarket and coming out with a complete impulse purchase. This week it was these very elegant yet substantial-looking mushrooms, labelled “Eringi”. When I got home and googled Eringi, I realized these were the elusive King Oyster mushrooms (pleurotus eryngii) I had been looking for to make a recipe that caught my eye on the Nom Nom Paleo blog. Result! After just a few minutes of prep using a mandoline, these went in the oven to cook until crispy. The finished chips deliver a very intense umami flavor. 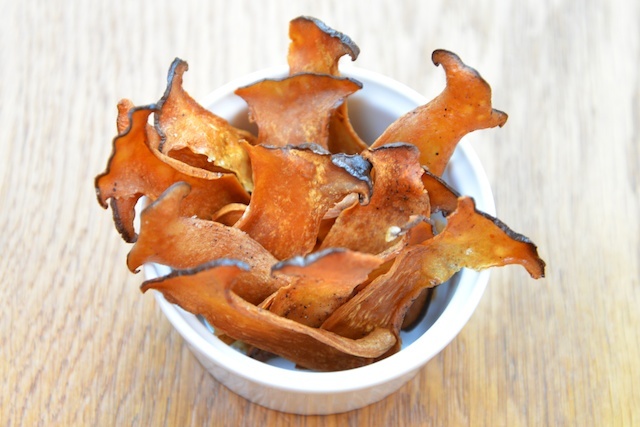 My mushroom-loving daughter was delighted with the chips, and I can confirm they made an unusual but delicious aperitif snack with a glass of wine. Preheat your oven to to 150°C/300°F/gas mark 2. Line a baking sheet with parchment paper. 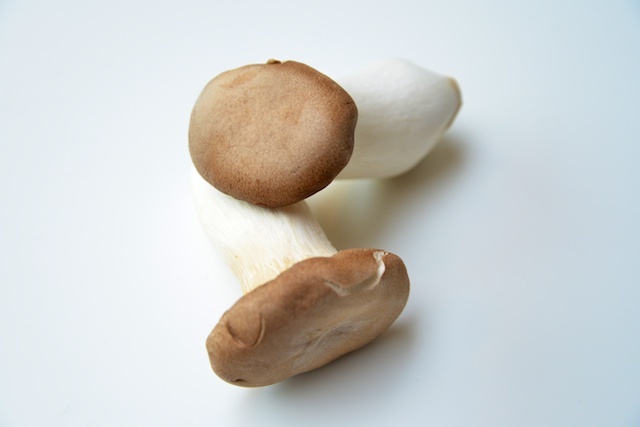 Clean the mushrooms with a damp paper towel and dry carefully. Cut each mushroom in half lengthwise, then slice lengthwise using a mandoline on the thinnest setting. 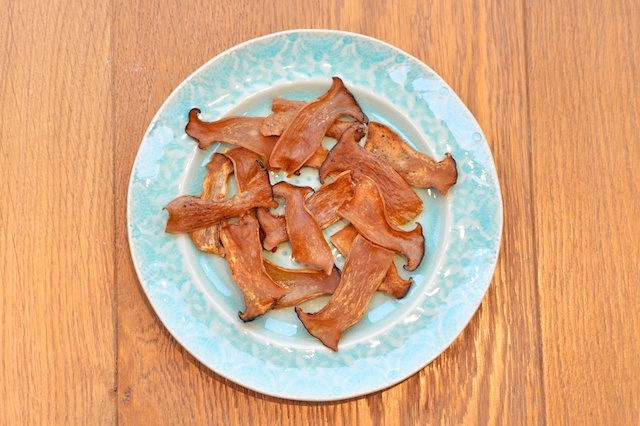 Place the mushroom slices on the baking sheet in a single layer. Brush lightly with the melted ghee, and season lightly with salt and pepper. The chips will need about 60 minutes in the oven, but start checking after 45 minutes. When done, the chips should be completely crispy – there were a few slightly soft chips that I had to put back in the oven for 10 minutes. 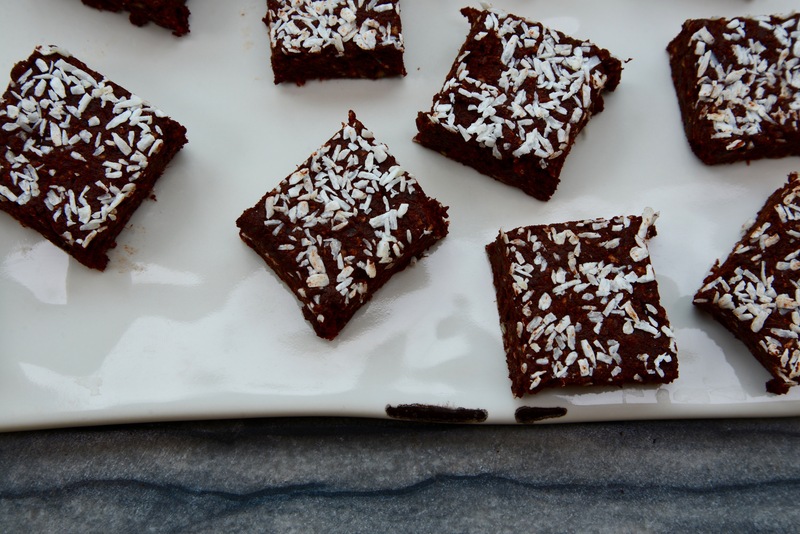 Carefully remove from the baking sheet and blot on some paper towel, then serve immediately. Healthy breakfasts have been on my mind a lot lately. I have been working on quite a few new breakfast recipes for the blog. I have also been trying to shake things up at home with some new breakfast ideas since the new school year started. I even talked with Mark Forrest on BBC Radio about healthy breakfasts a few days ago. I would love to hear from you about how you keep breakfast healthy and interesting – please do speak up in the comments section. 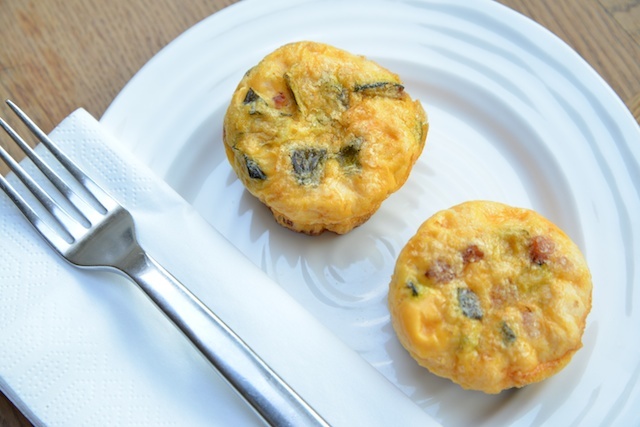 In the meantime, these muffin breakfast frittatas were a hit at home. I made these with some (leftover) roasted courgette and pancetta but any vegetable, meat or fish would work (as well as cheese for those of you who eat dairy). My kids brainstormed some combinations they would like, so next up will be peas + spinach and potatoes + salmon. 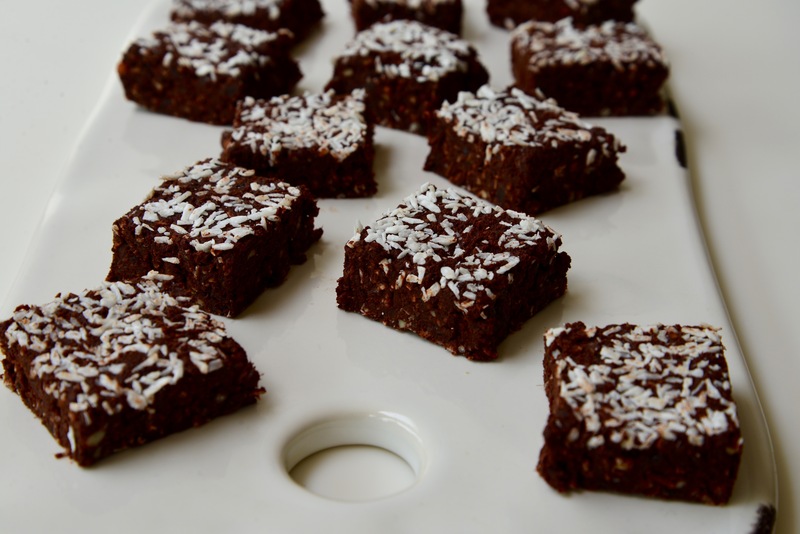 I made them for breakfast but they would also work well in a lunchbox or as a snack on the go. Preheat your oven to 170°C/325°F/gas mark 3. Grease a muffin tin or silicone muffin tray with a bit of ghee or oil. In a large bowl, beat the eggs until frothy and season with salt and pepper. Mix in your chosen fillings, then distribute into the muffin tin sections. Bake for 20 minutes, then allow to cool for a few minutes before removing the frittata muffins from the muffin tin. Happy new year! 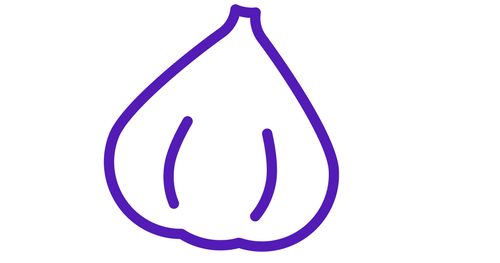 Here’s wishing each and every one of you a wonderful 2014 filled with good health and delicious food. It’s been a year now since I started the blog section of my website. Thanks so much to all of you who have supported me and cheered me on. My most popular post of the year was Slow-Roasted Duck Legs, with 261 hits! I have big plans to continue posting recipes and fact sheets this year. In particular I will be adding more GAPS-friendly recipes, as GAPS has been increasingly significant in my clinical practice. Kale chips might be a little bit 2013 by now, but they are still easy and delicious. So if you have never made them, I urge you to have a go. I used curly purple kale, but any variety works for this recipe. Wash the kale leaves and dry in a salad spinner. Tear the leaves into large bite-sized pieces, taking care to discard the tough central stem. Toss with the olive oil in a bowl, then arrange the kale on a baking tray in a single layer. Bake for 20 minutes or until crispy. 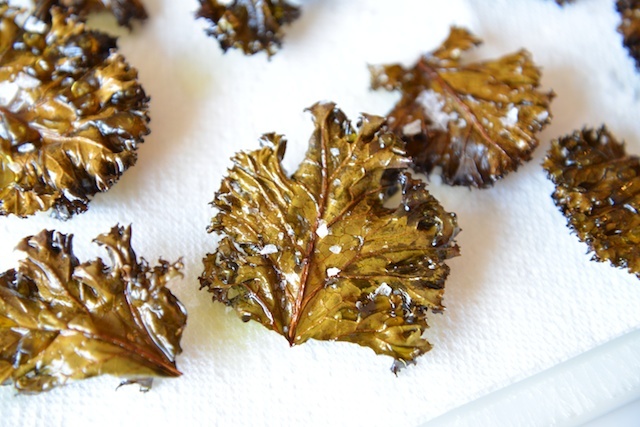 Remove from the oven and put the kale on some kitchen paper to blot excess oil. Sprinkle very generously with sea salt, and serve as a snack.